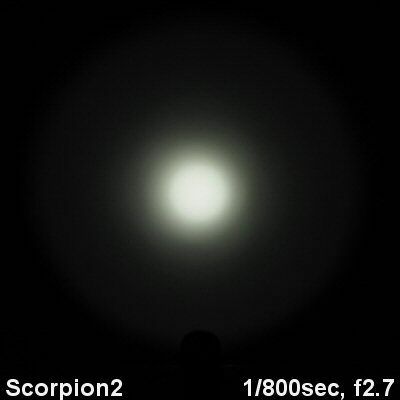 Thrunite Scorpion V2 (XM-L) + Turbo Head Review: RUNTIMES, BEAMSHOTS and more! Warning: even more pic heavy than usual. Thrunite has just updated their Scorpion model with a new circuit - featuring much higher output, and a revised interface. Let us see how this V2 compares to the original V1 and other members of the class. Uses 2x 3V CR123A batteries (Lithium) or one 18650 rechargeable battery (Li-ion), voltage range 2.7V-8.4V. NEW: 2x 3.7V RCR are now explicitly warned against in the manual, due to the high discharge current on Max. NEW: Battery low voltage warning system: when battery voltage drops to 2.8v (previously 2.9V), output will drop to low level. Previously, the light shut off at 2.7v (it no longer appears to). 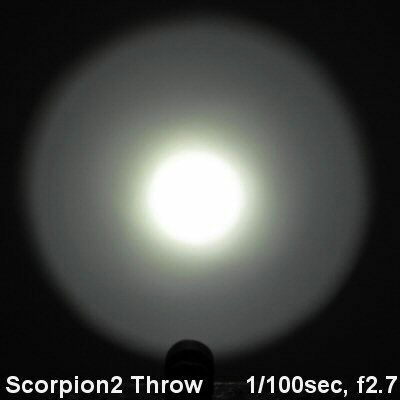 Smooth reflector (30mm diameter; 24mm depth) maintains good throw. NEW: The Scorpion features a unique five stage UI with a twist ring on the tail cap. The ring rotates from left to right for the following modes: Lock out, Infinite brightness with memory, Firefly; Momentary Strobe; and Momentary On (relative order has now changed). MSRP: unknown at this time, but I believe will be shipping soon. Thrunite was also kind enough to send along a new Turbo head for the Scorpion V2 for testing. No specs on it yet, but it does improve the throw (as you will see below). Packaging has been updated for the new Scorpion V2. The cardboard case now comes with a colourful slip cover. Inside you will find the light, wrist lanyard, and spare o-rings (as before) – but also included now is a reasonable quality holster with closing flap. A revised manual is also included. The Turbo head came in its own box. I suspect this will be sold separately. 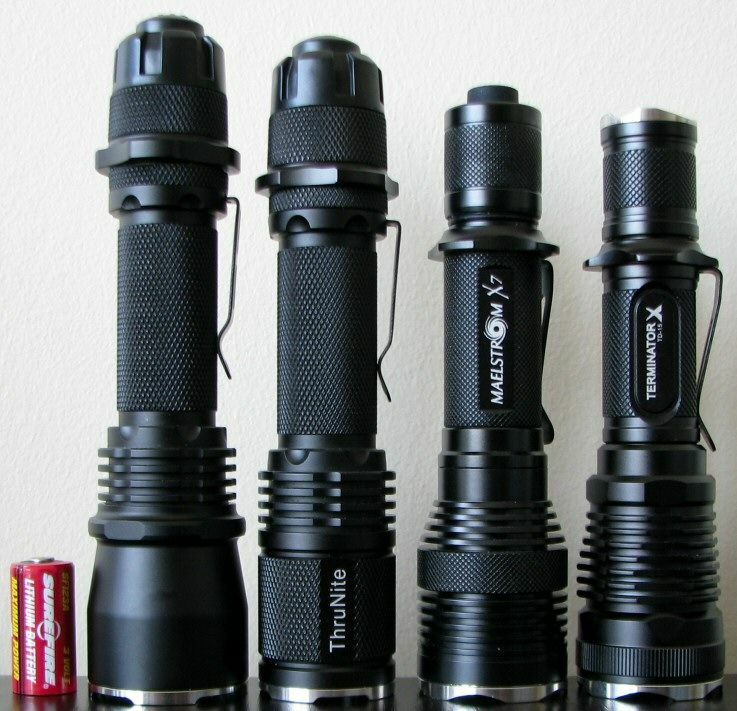 From left to right: Surefire CR123A, Thrunite Scorpion 2 with Turbo head, Thrunite Scorpion V1, 4Sevens Maelstrom X7, Lumintop TD-15X. The Scorpion remains a tad beefier than most lights in this class, with apparently heavier heatsinking in the head (noticeable head weight difference compared to other lights). Length is also a little longer than typical, due to the control ring in the tailcap. Turbo head adds a little extra length. The standard head Scorpion V2 is unchanged from the previous version – in terms of physical appearance. As before, the light feels quite solid and durable overall. 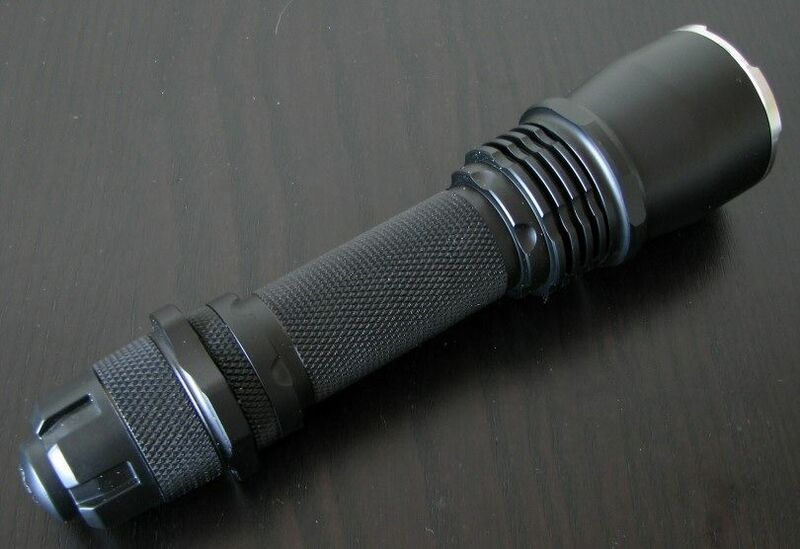 Clip is removable, with a knurled ring cover to hide the attachment point. Note the clip is not reversible. 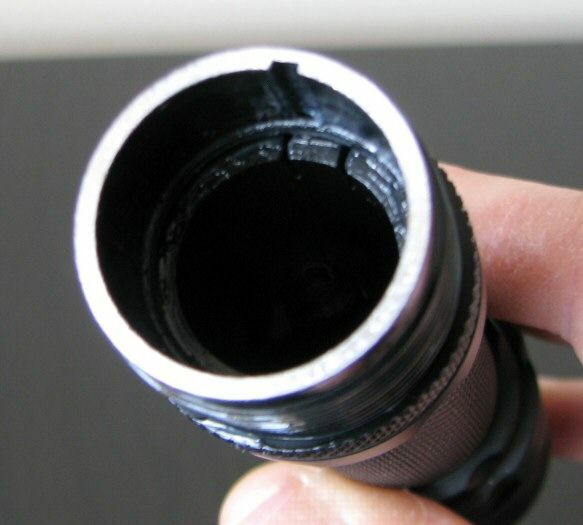 Black anodizing (type III = HA) is in matte finish, similar to the Neutron series. Lettering (which is minimal) is bright and clear. 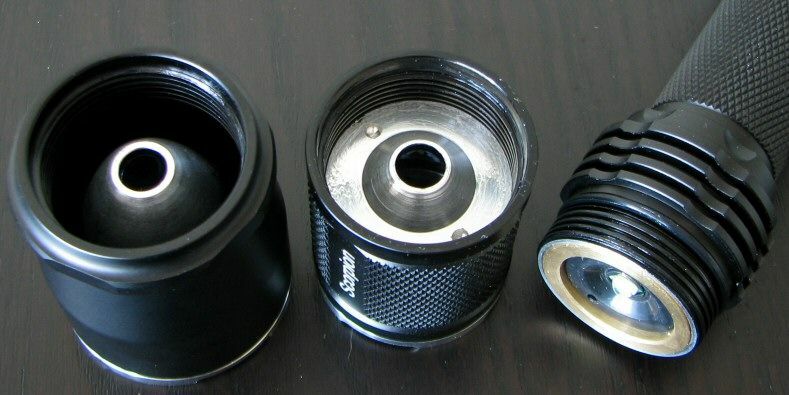 Knurling is reasonably aggressive (similar to the Neutron series), and there is a generous amount of it over the light and tailcap. 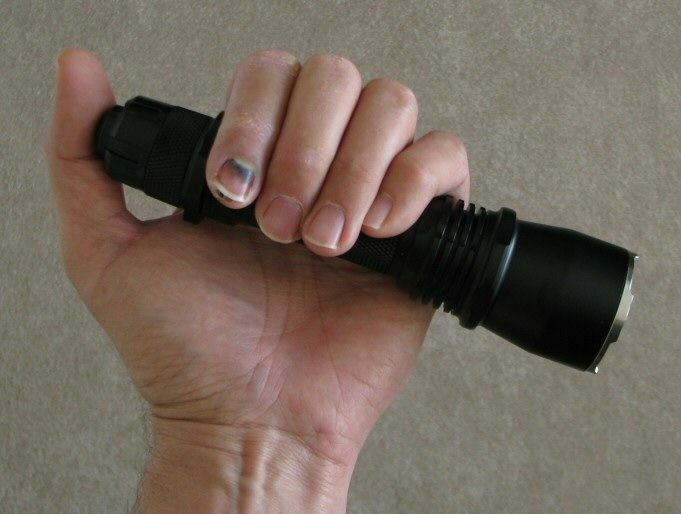 Grip is good, especially with the removable clip and built-in tailcap aluminum grip ring. 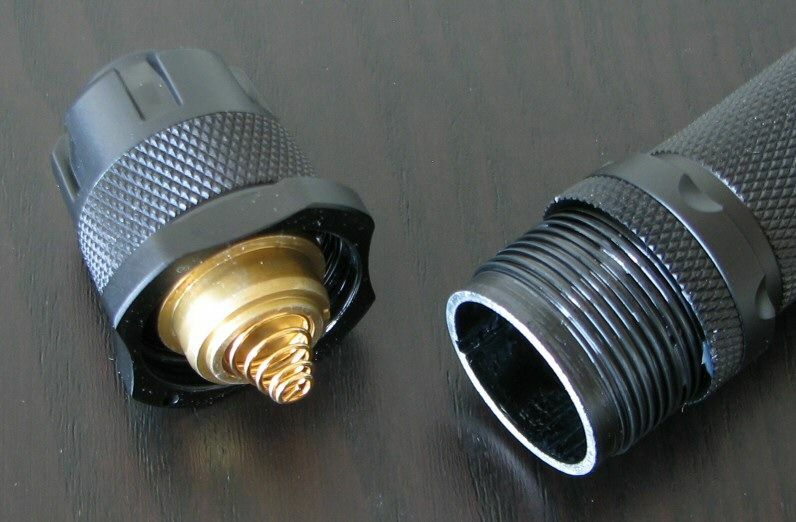 Square-cut screw threads are anodized for tailcap lock-out. Light cannot tailstand. 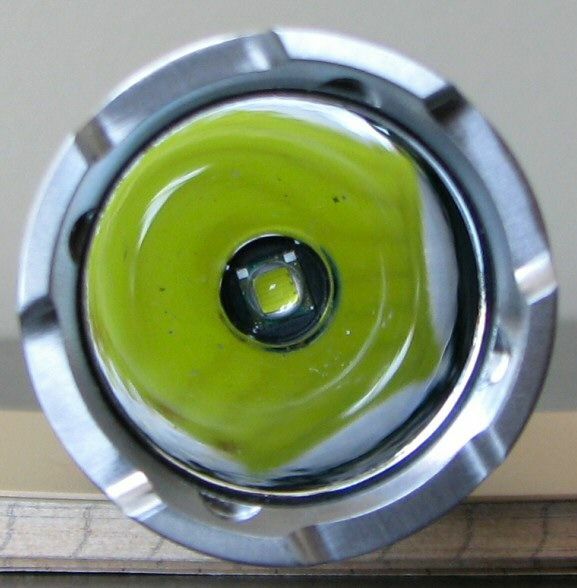 As before, there is a spring on the positive contact plate in the head, insuring contact for flat-top cells. I had trouble getting most of my high-capacity 18650 cells to work in the V1 sample (seemed to be too long, preventing the tailcap from screwing down all the way). But everything worked in my new V2 sample. The tailcap looks identical to before. 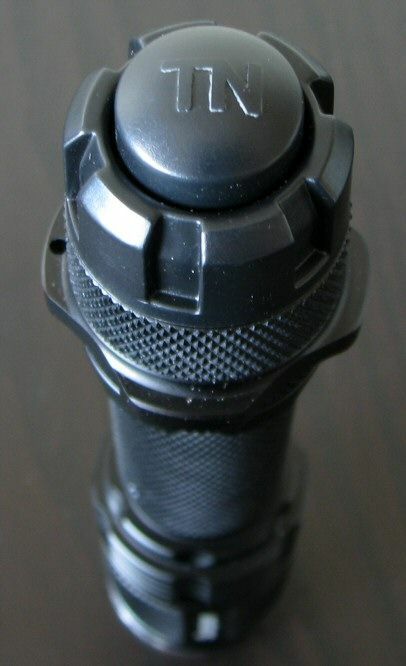 The tailcap exterior is composed of two distinct regions – a metal base (the grip ring and knurled region) and a polymer (i.e. plastic) control ring and switch. 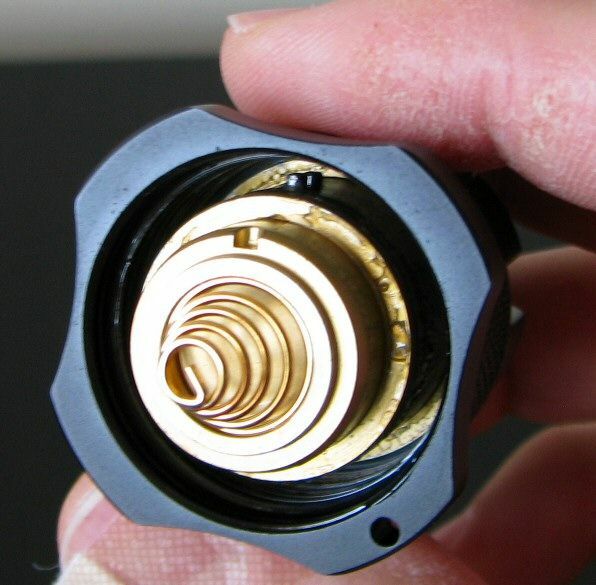 The control ring is directly connected to the substantial spring assembly unit inside the head, and the whole area spins freely when the tailcap is not attached. FYI, this design is remarkably similar to the Night-Ops Gladius. Not surprisingly, the interface is also nearly identical to that of the Gladius, except for the addition of the extra Firefy mode on the Scorpion. More on that (and the V2 revisions) in a moment. As before, it is very important you carefully line up the groove area with the tailcap ridge (by turning the plastic control ring) before tightening the switch assembly (by screwing the tailcap by the metal grip area). This new V2 seems somewhat smoother in my testing, but even the V1 worked fairly well. Still, be careful not to every try and force the tailcap when screwing on - you may damage the switch if overly careless. Once in the groove, the control ring now moves between 4 clear detents that set the output modes of the light. For more on how the control ring works (and the V2 revisions), please see my User Interface discussion below. The Turbo head doesn’t look out of place on the light (in fact, they could probably have gotten away with an even larger one). There is no knurling or markings on the sample I was sent, so it is possible this is still an engineering sample. Note: Don't worry about those little black specks in the pics above - it is simply dust on or around the emitter dome being reflected and magnified by the angle of the pic. Given the open head (with the ability to swap reflector/bezels), it stands to reason some dust and debris will get in from time to time. I just gave the bare emitter a mild shot of compressed air, and the specks disappeared upon reassembly of the reflector/bezel. 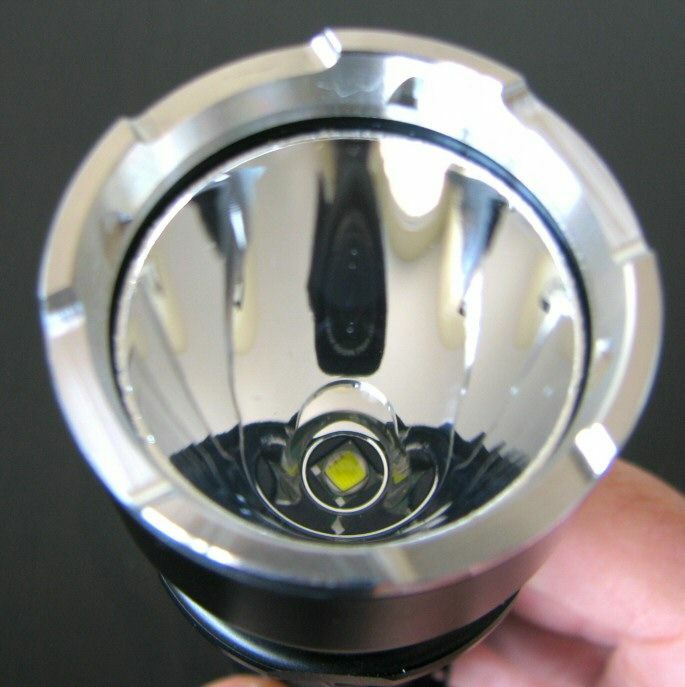 Both heads have a fairly deep and smooth reflector, with a well-centered XM-L emitter. I would expect reasonably good throw from both versions, with of course an advantage to the larger reflector in the Turbo head. Which brings me to the white-wall beamshots. All lights are on AW protected 18650, about ~0.75 meter from a white wall (with the camera ~1.25 meters back from the wall). 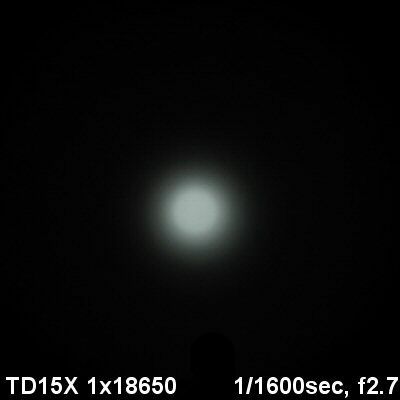 Automatic white balance on the camera, to minimize tint differences. All beamshots taken immediately upon activation. 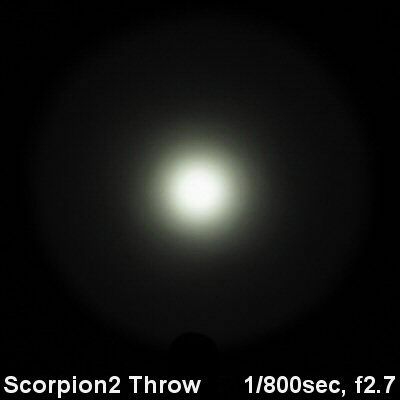 Note: "Throw" refers to the V2 with Turbo head, and the original V1 is simply labeled as "Scorpion". 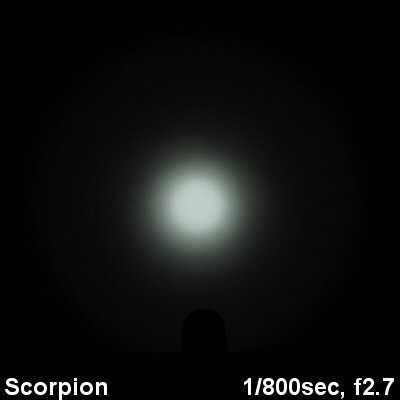 The Scorpion V2 is running on Max in the Ramp mode (1x18650). First thing you will notice is that the new V2 packs more punch than the original V1 (i.e. is brighter overall). The optional Turbo head adds a bit more throw, but it isn’t so obvious this close to a white wall. Which brings me to my outdoor beamshots. 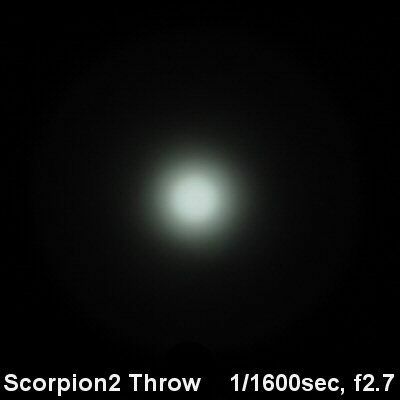 I have just posted a new 100-yard round-up beamshot review for 2011, showcasing all my current "thrower" lights. Below are a couple of animated GIFs for relevant comparisons. Please see my round-up review for additional pics of other lights. 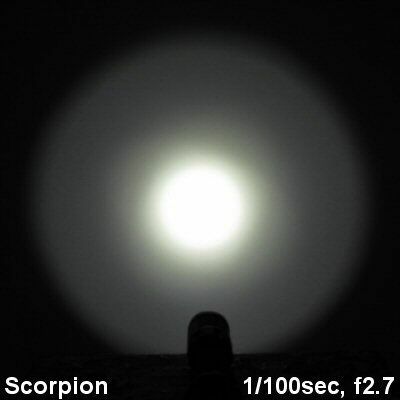 Note that these beamshots are also all taken immediately after initial activation of the light. 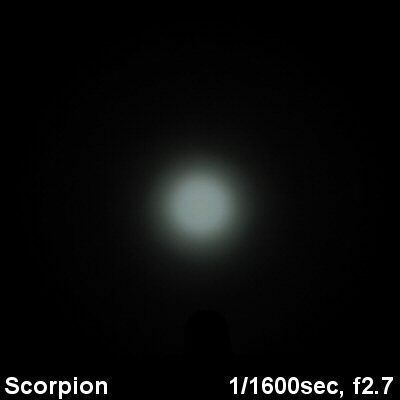 Also, my Scorpion V2 is running on 1x18650 in the Momentary Max for these beamshots. Momentary mode on 2xRCR/CR123A would be slightly brighter initially (see my Summary Tables below for a discussion). The V2 Turbo holds its ground pretty well, relative to the TK35 and BC40 for example. Of course, runtime will be a lot less on the 1x18650/2xIMR RCR Scorpion V2. Well, well, well – this is the first XM-L light to actually throw as far (or further) than my dedicated XP-G R5 throw lights. Scroll down to my Summary Tables for actual lux measures of all lights, on various batteries. The UI has been revised from the original V1 Scorpion. I suggest readers refer back to that review for a more detailed discussion – I will focus here on what has changed in V2. As before, care has to be taken in how you screw on the tailcap (i.e. the raised ridge on the interior assembly must be lined up with the groove on the body tube before screwing it down). When fully assembled, you will still feel four clear detents on the plastic control ring for the four output modes of the light. But the sequence has changed from before. To start, the first position remains Lock Out. From the left most detent, partially depress the switch, and turn the control ring further to the left (i.e. counter-clockwise). This locks the switch partially depressed, and you lose all the detents on the ring. At this point, the light won't come on or off by the switch until you turn the ring again while holding down the switch (causing it to release the lock on the switch, which pops back out). 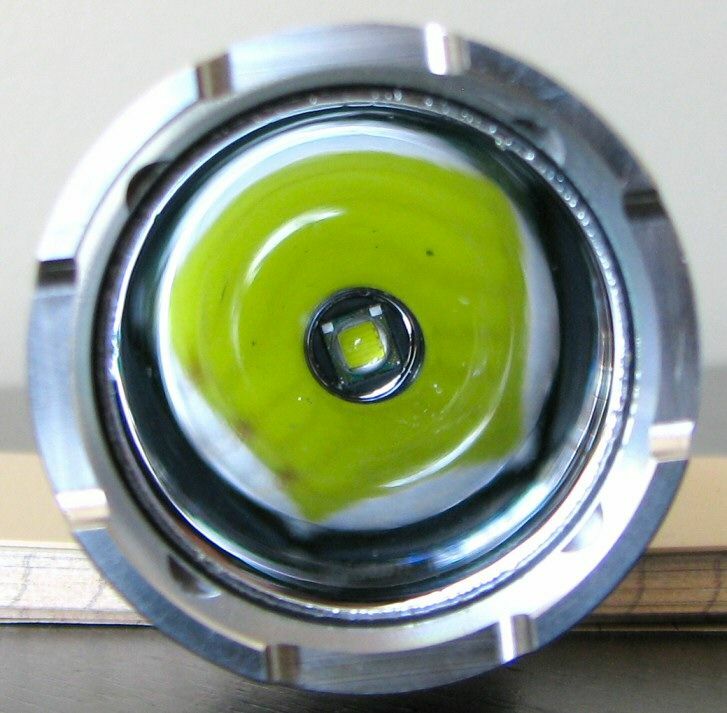 Note that thanks to the screw thread anodizing, you can still also lock out the light by simply unscrewing the head a quarter turn (i.e. by holding the metal base of the tailcap and turning). In sequence, the next four modes (i.e. moving to the right, or clockwise) are now Infinite Brightness, Firefly, Momentary Strobe, and Momentary Max. Previously, the sequence was Firefly, Infinite Brightness, Momentary Max, and Momentary Strobe. Note that the Infinite Brightness mode has memory, and retains the last setting used (as before). The main change is in the Infinite brightness mode. The ramping (activated by a press-hold form Off, as before) now has a reverse function - it changes direction of the ramp if you release the switch and re-press. This is convenient if you miss the output level you wanted – just switch it off and press-hold on again, and the light will reverse the direction (i.e. don't have to wait for the whole cycle, as before). Ramping time is also shorter now (about 5 secs, see graph below), and it uses a visually-linear logarithmic ramp now (instead of a standard current-linear ramp). 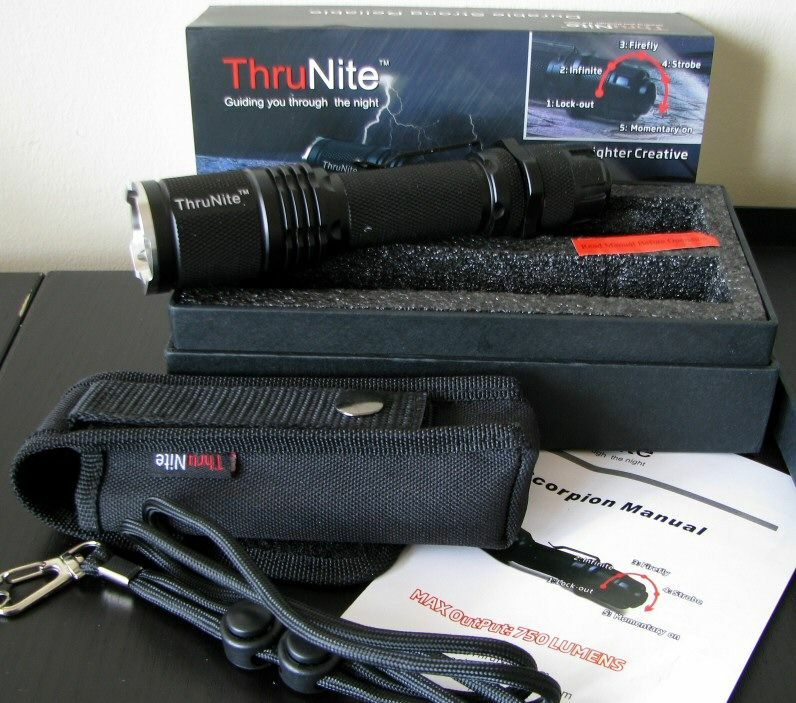 Thrunite informs me the brightness varies 5%-89% (150mA-2.6A) across the ramp. You will note the lowest point of the ramp is higher than before. Also, there is no longer the short re-activation delay when resetting the ramp. 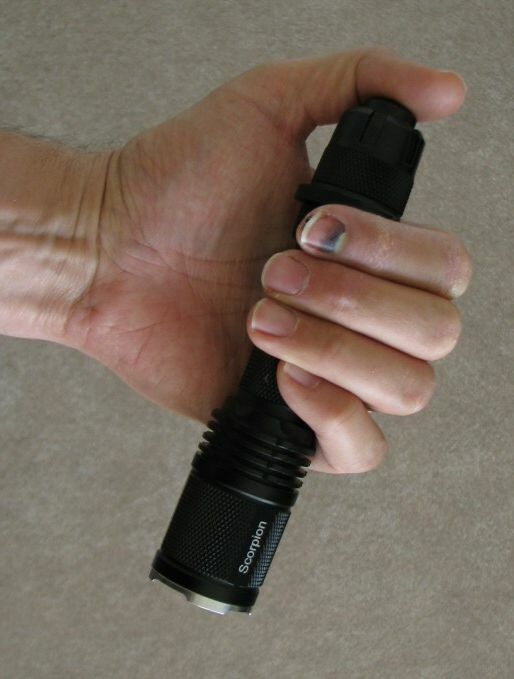 Before, if you flashed off-on too quickly, the light would not re-illuminate (i.e. need to wait a sec or so). But the most significant change to the Infinite Brightness circuit is how it regulates output levels: the V2 is now current-controlled – so no more visual PWM. There is no longer any pre-flash when first connecting the circuit. 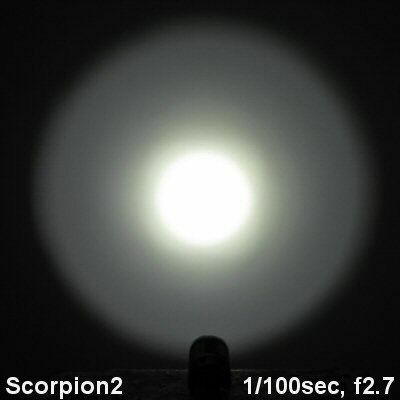 On my V1 Scorpion, I always had a brief max output pre-flash when making initial contact of the tailcap with the battery (and potentially a second pre-flash when fully tightened). This is now completely gone. Also, if you turn the ring to another position while the light is on, you no longer need to turn off before re-activating in that mode. You do still need to click the switch – but now it simply adjusts to the new mode smoothly, without output interruption. Finally, Thrunite has increased the current of the Momentary Max mode on 2xRCR and 2xCR123A - you get 3A for 1 min, followed by drop-down to 2.5A for the rest of the run. In contrast, the Infinite Brightness ramp mode is 2.5A at its highest level, on all batteries. As mentioned above, PWM is now completely gone (previous V1 was a noticeable 250 Hz). Strobe now matches the 10 Hz spec (my previous sample was 13.1 Hz, similar to the Neutron series). Note that my estimated lumen values may be a bit on the low side for these newer XM-L lights. My calibration was based on lower output lights, so the absolute relationship may not hold at this higher level. But you can still rely on the relative relationship between lights measured in my lightbox (i.e. to let you know how they perform relative to one another). 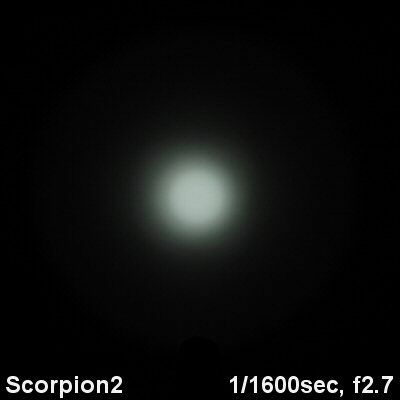 UPDATE JUNE 9, 2011: The Scorpion V2 is driven harder for the first 1 min on Momentary Max on 2xRCR and 2xCR123A (i.e. 3A, then drops down to 2.5A), but not on the Max of the Infinite Brightness mode (i.e 2.5A on all batteries). Below are some tables comparing estimated lumen output in my lightbox, and corresponding throw/beam distance, for all batteries. As you can see, 2x battery sources are brighter for the first minute. 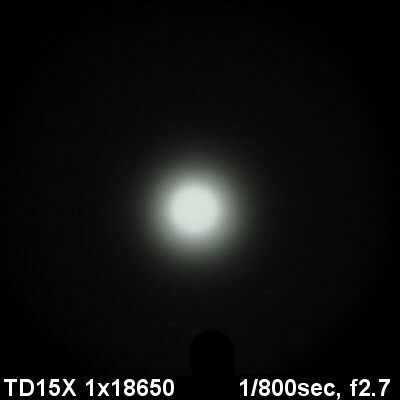 I also see a slight initial increase in the 1x18650 Momentary Max mode, but this is relatively minor compared to the 2x diference. This complicates things for ANSI FL-1 output and throw measures, as output is taken at 3 mins into the run (which is typically slightly higher on Ramp Max that didn't have the burst mode), but throw/beam distance is calculated at 30 secs (where Momentary Ramp is definitely higher). As such, I have adjusted my tables below to reflect the absolute highest value (i.e. output is measured at 3 mins into the Ramp Max run, but throw/beam distance is measured at 30 secs into the Momentary Max run). Aside from these throw/beam distance values, all testing in this review was done on the Ramp output levels unless stated otherwise. As I am sure you can understand, I didn't plan to hold the button down for a couple of hours for runtimes. So how do the max ANSI FL-1 levels compare to the competition? Note that the Min lumen estimate is based on the Firefly mode. The lowest level of the continuously-variable ramp is shown in brackets beside it. 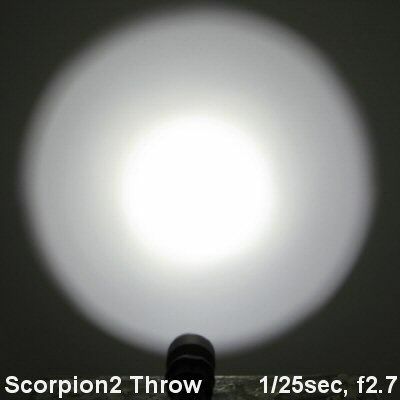 As you will see, both the Firefly and lowest continuously-variable mode have increased on the Scorpion V2. In practical terms, I still find the Firefly quite low. However, it is disappointing that the ramp doesn’t go lower – this is likely a trade-off for current-control (on the V2) replacing PWM (on the V1). On Max, the V2 is very impressive – especially on 1x18650, where it clearly outshines the competition in this space (both for output and throw). On 2xRCR (IMR only, due to the excessive discharge rates), the V2 with standard head is in a virtual dead heat with my Lumintop TD-15X (both for output and throw). And with the Turbo head, it handily out-throws anything in this class. More than that, these numbers also show that the V2 with Turbo head out-throws my two furthest throwing XP-G R5 light – the Lumintop TD-15 and Armytek Predator. 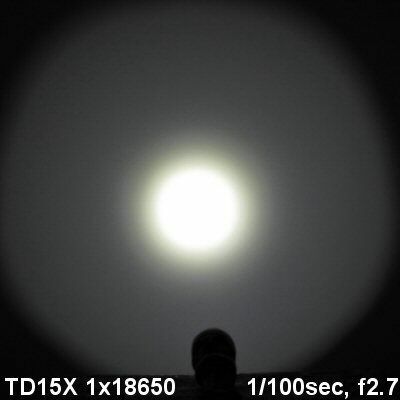 You can also see this in the outdoor beamshots shown earlier in this review. 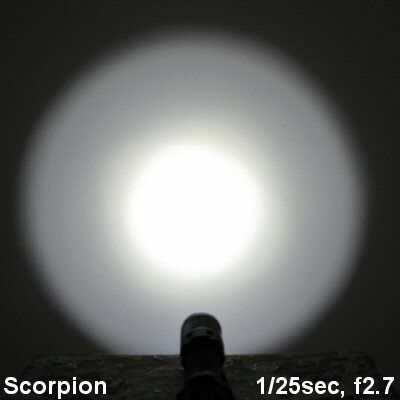 Consistent with what you saw in the outdoor beamshot comparisons earlier in this review, the Scorpion V2 with Turbo Head is pretty close in output and throw to the Fenix TK35 and JetBeam BC40! Note: Keep in mind that my lighbox's relative output scale is NOT linear over the range of outputs. And again, all runtimes were done in the Ramp output mode. Please refer to the tables above for a lumen estimate comparison of output. Note the V2 no longer shows the abrupt shut-off as the light nears the end of the run. The warning flash indicator now comes on slightly later as well (2.8V). I suspect both of these changes are in response to users' feedback (i.e. no one like a surprise shut-down of the light, or warning flashes too soon). Max output has increased across the board, on all batteries. Although 2xRCR is not recommended (due to the high discharge rate), IMR cells should be safe – as long as you manually terminate the run as soon as the light starts to flash. Output/runtime efficiency has also increased, likely thanks to the new current-controlled circuitry. 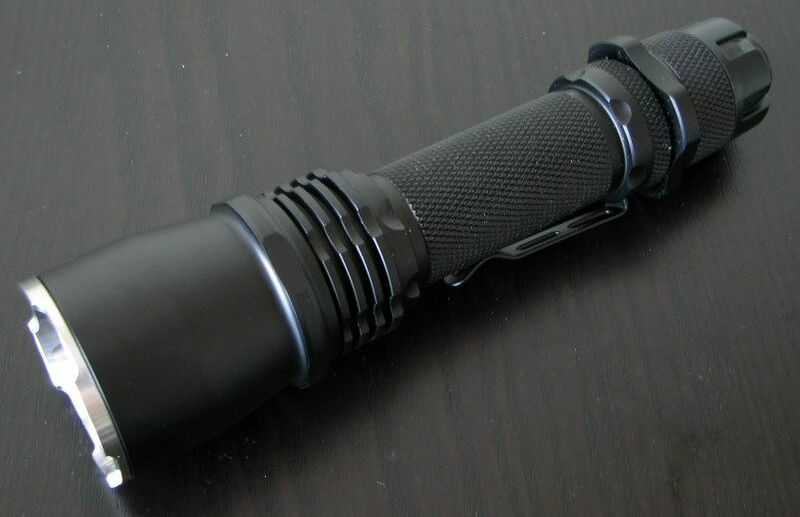 By the time you get down to ~100 lumens or so, the V2 runs for twice as long as the V1. UPDATE JUNE 27, 2011: It seems the high drive level at max output may cause some CR123A batteries to eventually overheat and trigger their PTC protection circuits. Here is comparison of two battery brands, with and without external cooling. As you can see, at varying points into the run (depending on battery and cooling), output drops considerably then slowly recovers. This is likely due to the PTC limiting current in response to heat (as tested and discussed in more detail here). I have observed this behavior before, on a number of maximally-driven 4xCR123A lights. To be on the safe side, I recommend you do not run on max output for extended periods on this battery source. I am happy to report that many of the issues identified in my original V1 review have now been fixed/revised on the V2. In terms of the circuit, the visually-detectable PWM is gone (now current-controlled), as is the pre-flash on making initial battery-tailcap contact. Similarly, output/runtime efficiency has improved from before (which was low on the V1 for a XM-L based light). The Infinite Brightness feature now functions in an improved way (i.e. can reverse direction, no delay, faster and more visually-linear ramp). There are also a number of small tweaks to improve how the control ring functions, including improved mode switching and a revised mode order based on user feedback (see my UI discussion above). Build-wise, little has changed – except the tailcap/body tube contact ridge has been enlarged to ensure consistent operation. My V1 Scorpion had difficulty taking most of my high-capacity cells – but my V2 sample worked on everything I tried (although a few of the longer ones did require a bit of force to fully tighten). That being said, the tailcap control ring still has a fairly novel and unique action, which may take some getting used to (although it is more comparable to the Gladius now). The main new concern from the original V1 is the drive level of the V2 on Max and near-maximal levels is now much higher. These 3A/2.5A levels are too high for standard RCR – you would need to use IMR cells if you are to attempt it. 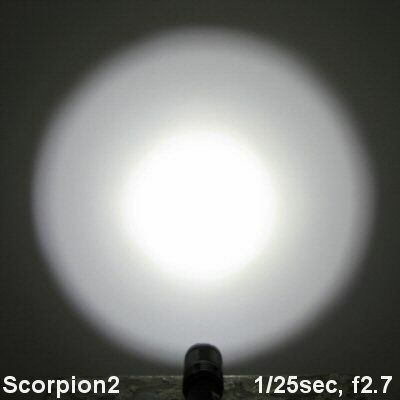 In any case, I am always concerned about heat in maximally-driven lights – the Scorpions seem to have reasonably good heatsinking for their size, but I worry these levels may be pushing it pretty hard (i.e. output is in the same league as some 2x18650-sized lights). Use of current-control means that the Infinite Brightness mode cannot go down to as low a level as before (i.e. PWM can support much lower output levels). Current-control can also result in tint-shifting at lower outputs, but I didn’t notice anything significant on my V2. This is not seen on PWM, since the drive current is constant at full power (i.e. only the duty cycle changes). However, most users will likely prefer the increased efficiency and lack of flicker now (I know I do). UPDATE JUNE 27, 2011: It seems the high drive level at max output may cause CR123A batteries to eventually overheat and trigger their PTC protection circuits. I recommend you do not run on max output for extended periods on this battery source. The new V2 Scorpion may superficially look the same as old one, but a lot has changed "under the hood". The most obvious difference is when you turn it on – Max output has increased by over 50% in some cases (i.e.on 2xCR123A, from ~495 estimated initial lumens in my testing of the V1, to ~780 estimated initial lumens on the V2). What is even more impressive is how hard they have managed to drive it on a single 18650 cell. 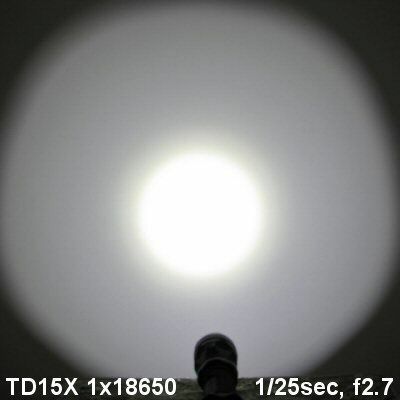 No doubt about it – this is the brightest 1x18650 XM-L based light I’ve tested to date. It also throws the farthest, especially with the optional Turbo head (more on that in a moment). It terms of output, Thurnite’s reported output lumen numbers seem very believable (I don’t have a calibrated integrating sphere to confirm, but my estimates are consistent). But a lot more has changed here than just Max output. The entire continuously-variable ramp has been redone with a new circuit that is current-controlled (i.e. no longer uses PWM). This has a number of immediate positives - most obviously, no flicker . 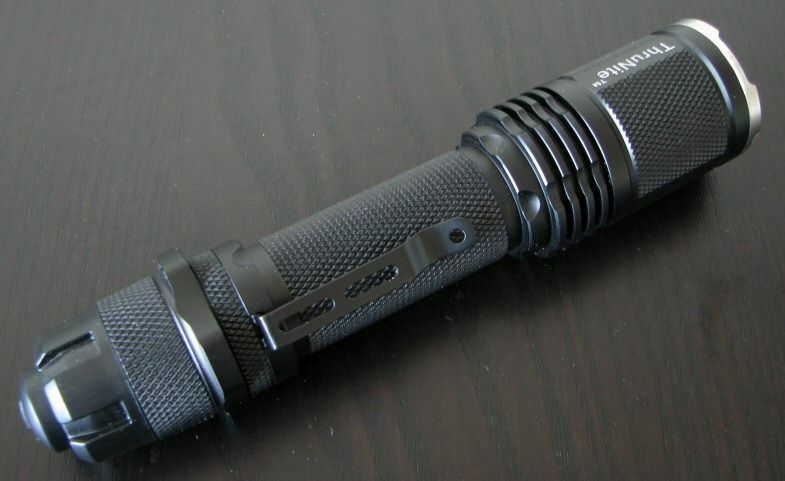 It also means increased efficiency – by the time you reach ~100 lumens, the new V2 runs about twice as long as the V1. One downside to this change is the lowest level of the ramp is now about 5 times higher (i.e. 37 vs 7.3 estimated lumens in my testing). The other major circuit change is in the UI, where a number of obvious (and more subtle) changes have taken place. First off, the order of modes has changed (based on user feedback here). Personally, I do like seeing Momentary Max at the far end of the dial (easier to remember that way). But there are also all sorts of small changes that make the light more user-friendly, IMO. The connection pre-flash is gone, and you can now switch modes without having to turn the light off first. The activation delay when setting the continuously-variable ramp is gone, and you can now immediately reverse direction of the ramp by switching off-on. The new optional Turbo head is particularly impressive. Not only does it give the V2 best-in-class throw, it is also renders it the first XM-L light to match or out-throw all my dedicated XP-G R5 throwers (at least up to 100 yards). More than that, you get a similar beam profile (i.e. 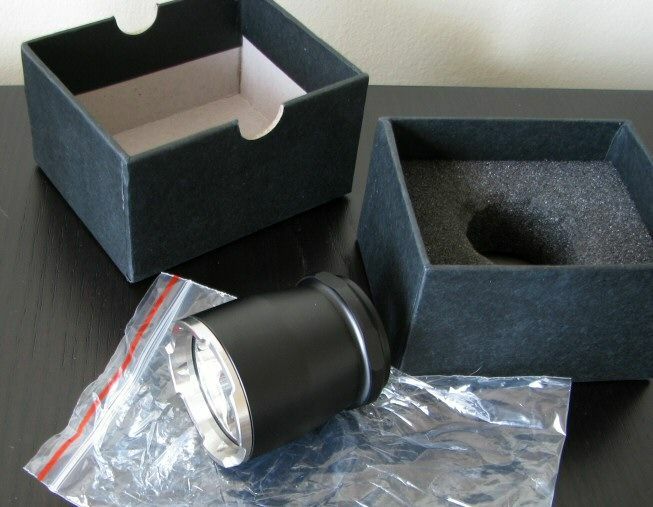 output, spill, and throw) to the 2x18650-based Fenix TK35 and JetBeam BC40 - but in a 1x18650-sized light. Of course, heat at these maximal levels will be a concern on the smaller Scorpion. It is nice to see a manufacturer listen to the feedback (and criticisms) of a given model, and come back with a significant improvement in a second version. It seems like Thrunite has addressed all the issues I identified in my original V1 review, and even thrown in a few bonuses like much higher output and a Turbo head throw option. 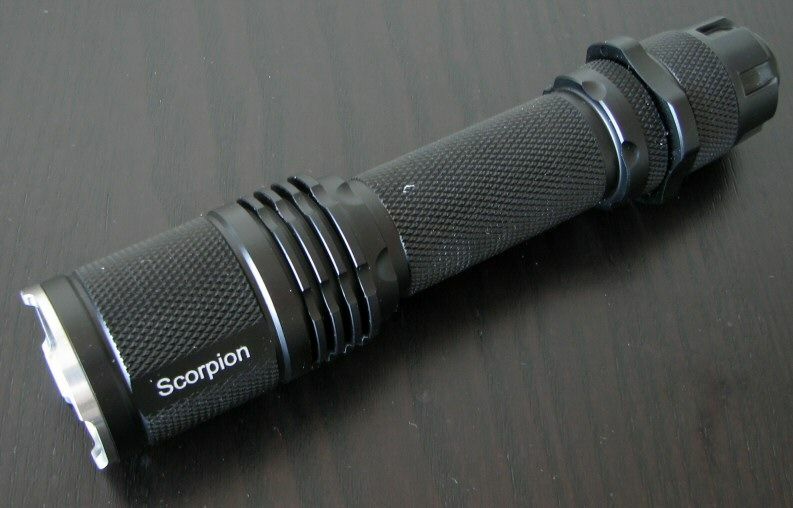 If you are in the market for a "tactical" high-output XM-L light, the new Scorpion V2 has a lot to commend it. P.S. : My understanding is that this new version will begin shipping any day now, but please check with Thurnite for updates. Scorpion V2 provided by Thrunite for review.